Just in time for the 4th of July! I am loving this table right now! This is a coffee table that I redid for a friend who was transferring to Chicago. 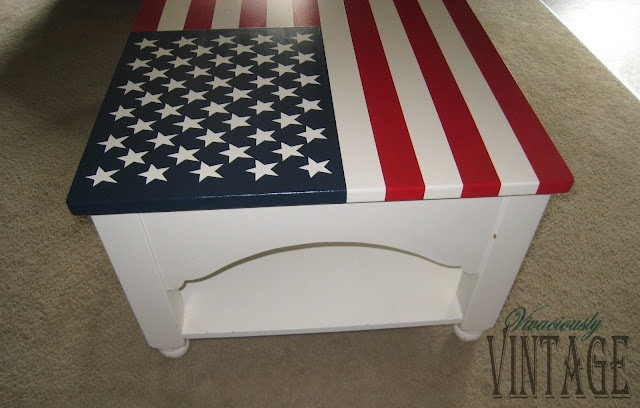 :( Her decor is Americana inspired, and she requested Old Glory for her table makeover. This table is one in her set of 3. Because I did not want the coffee table to be a different color white from the side tables, I chose not to paint the entire thing. However because her table was very well loved, I had to paint the top of it white to ensure that those white stripes were crisp and clean. Most importantly, this project is all about proportion. Really all you need to pretty much turn anything into the American Flag are the proper dimensions! So here's a quick lesson about the makeup of Old Glory. 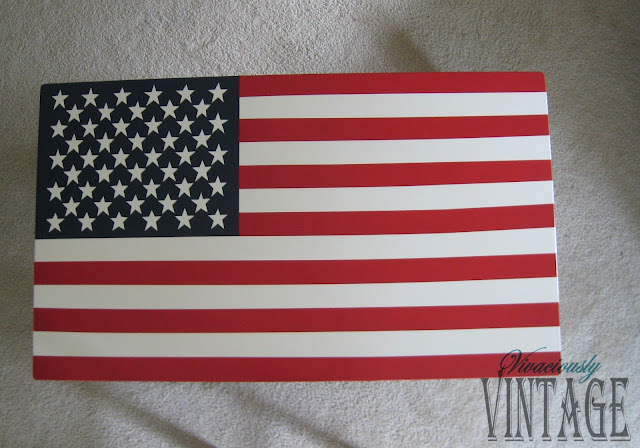 The American Flag has 13 stripes, alternating red and white. The blue starry section begins above the sixth stripe. This same starry section extends 2/5ths the width of the entire flag. Translating this into your project is easy. Measure the entire length of your piece and divide by 13. That is the width of each, individual stripe. Next, measure the width of the piece and take 2/5ths of that number. This is how wide the starry portion of your flag will be. To determine the length - simply start it above the 6th stripe from the bottom. Now, the stars. I confess that I laid awake at night thinking about "OMG how am I going to do those stars?". If you happen to have a silhouette machine, it should be simple. I do not - yet. For us cheapo's out there, here's what I did. 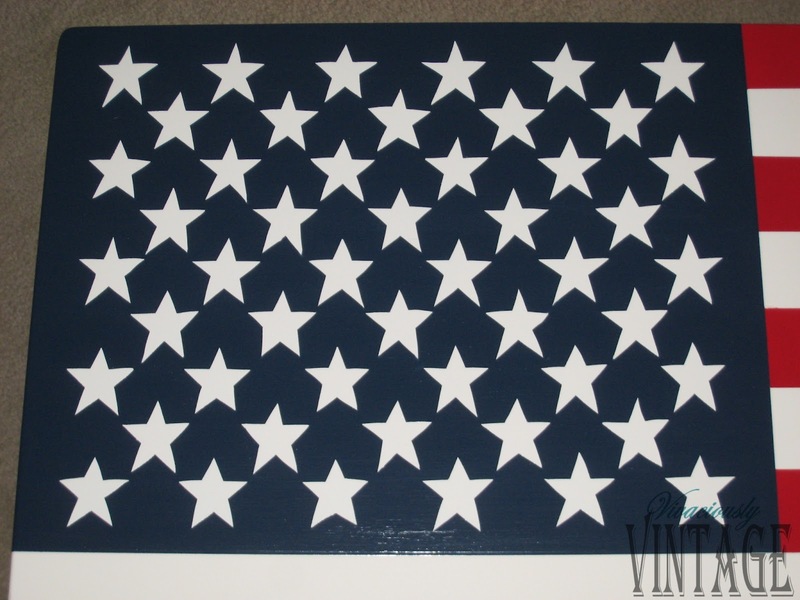 First, measure the length and width of the navy blue portion of your flag. Then take the image provided below to any copy store and ask them to blow it up to that exact size. Now it will be all blurry and distorted, but all you need is the general shape, size, and spacing of the stars. I created a custom stencil using that image and contact paper. Just lay the contact paper over the image and cut out with your xacto knife. Then stencil away! 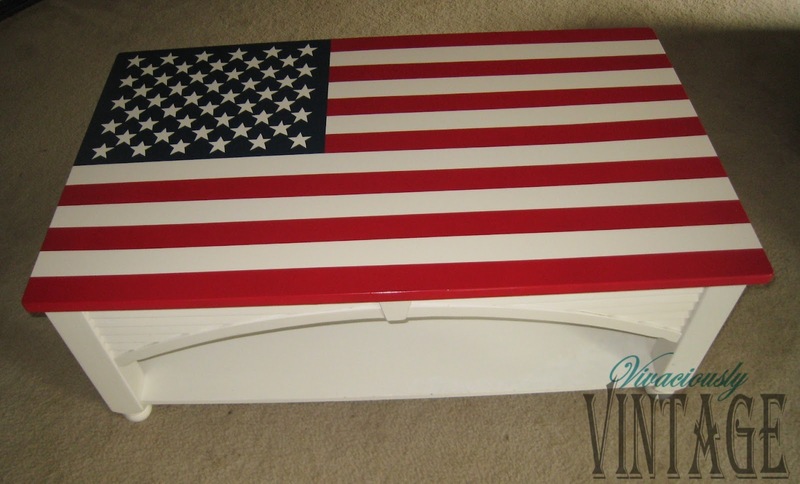 I know it's the red, white, and blue...but when painting you want to go white, red, blue!!! Or I suppose you could interchange the order of red and blue if you chose. Top it all off, with those awesome white stars!!! Have a fantastic 4th everyone!!! It's beautiful and you got the proportions down perfectly! You should send me pictures! I saw the ones you posted on Facebook, but there wasn't any furniture in the house yet! :) You KNOW I LOVE that stuff!!! Miss y'all!